As a matter of policy, the Provincial Government shall issue regular updates on major utility/infrastructure projects being implemented by the Provincial Government. For this maiden issue, the focus will be on the power and water initiatives. The Bohol Energy Development Advisory Group (BEDAG) was created under the Executive Order No. 01-2014 issued by Governor Chatto in March 2014. It is tasked to come up with an annual Power Plan for the island to avoid long blackouts due to lack of connections as experienced from Super Typhoon Haiyan (Yolanda). BEDAG is co-chaired by Governor Edgar M. Chatto and Energy Secretary Carlos Jericho L. Petilla. BEDAG, with assistance from Competitive Philippines, was able to prepare (through lectures and workshops) the Bohol Power Supply Plan (BPSP). The Bohol Power Supply Plan describes the future energy requirement the island will be needing in order for it to sustain and maintain the growing energy demand. The Bohol Power Supply Plan was presented by the BEDAG to the Bohol Provincial Development Council, headed by Governor Chatto, in October 2014. In order to have an encompassing energy plan, the BEDAG will require the preparation of Distribution Development Plans (DDPs) by the 3 Bohol Distribution Utilities (DUs) and secure approval and funding from the Philippine Government of the NGCP’s Transmission Development Plan (TDP) for Bohol. Both the DDPs and TDP will support the Power Supply Plan of Bohol Island, and together comprise the Bohol Island Power Development Plan (BIPDP). 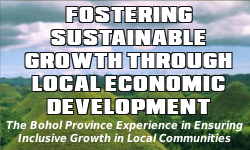 Last month (February 11, 2015), the Provincial Government and BEDAG organized the Bohol Power Investment Forum. The forum, an offshoot of the Bohol Competitiveness Summit (February 4 – 5) which was co-organized by the Provincial Government and USAID COMPETE, was a fitting follow through after the BEDAG-Technical Working Group (TWG) presented at the Competitiveness Summit the Bohol Island Power Development Plan – i.e, Bohol Power Supply Plan, Distribution Development Plans of the 2 electric cooperatives and the Bohol Light Company Incorporated, and the NGCP’s Transmission Plan. At least one of two Business Process Outsourcing (BPO) companies will be locating in Bohol soon. A new Panglao, Bohol Airport will now push through (also confirmed by Gov. Chatto). The project will start this April 2015. This means that the BEDAG-TWG will have to now include these and add to the Business as Usual forecast. The investment forum took from the form of an open “meet and greet” type. Ten (10) power investors attended the forum. All investors presented in the presence of the other investors. Most of the presentations provided sufficient information to glean their planned offers or what they might likely offer the province. The BEDAG-TWG did not conduct an evaluation at the forum. The activity was mainly intended for “scoping” and information sharing. Two companies expressed willingness to join a competitive procurement process, another one said, was impressed with the Governor’s initiative to form the BEDAG. At least one company noted taht all the questions needed to be asked in the forum were already answered by the presentation of Engr. Siga of the BEDAG-TWG. After the forum, Governor Chatto called for an executive session of the BEDAG. Comments on the presentations, current concerns and next steps were discussed. It was noted that the forum was an effective eye-opener, and, now more than ever, the importance of the BEDAG, the plans, and power supply strategies were affirmed. Governor Chatto was initially concerned with a news report that there will be a shortage of power in Bohol in 2 years’ time. COMPETE Team assured him that the BEDAG had fully evaluated the power demand situation and has determined that Bohol’s power requirements, if addressed sooner via competitive procurement of the short-term supply, would not be as problematic. Aggregation of the 3 Distribution Utilities: BOHECO 2 and BLCI have power supply agreements that are expiring in August this year. BOHECO 1 already has a Board Resolution authorizing them to join a “Bohol DU Aggregation.” The other 2 DUs have yet to formalize their intentions through similar board resolutions. Prospectively, aggregation will enable the 3 DUs to “procure” as a large customer and take advantage of the benefits of a competitive bidding process, including possibly lower generation rate. There are currently two groups of DUs (electric cooperatives) in Luzon and Visayas that are undertaking their preparations for a long-term competitive procurement — Region 1 + CAR (AGCARRECA group) and Region 8 (RENAGMEC group) — which the Bohol group can join. USAID COMPETE and UP-NEC have been providing technical advise to these two “aggregations” and will be able to link up Bohol in their ongoing preparations. The Bohol DU Aggregation needs to be accelerated via signing of a tripartite Memorandum of Agreement (MOA), possibly to be witnessed by the BEDAG. Bohol Diesel Power Plant – whether the DUs should contract with Bohol Diesel Power Plant (BDPP) for peaking and/or emergency power supply. The BEDAG has requested the cooperating UP-NEC volunteer consultants to provide guidance in the conduct of cost-analysis to ensure the protection of consumers. 4 MW Hydro Plant in Danao – construction is awaiting completion of the IEC and environmental study in compliance with existing regulations; BEDAG needs to monitor the eventual supply contracting by the DUs and to track the timeliness of its commissioning. Location of future plants. Whether to require plants to be built inside Bohol or not. One of the issues raised by two of the power generation companies in the forum was the transmission system. They are hesitant to build in Bohol due to the fact taht bohol’s load is not high enough and the connectivity of Bohol’s transmission system to other islands is limited. Transmission. There is transmission congestion due to Naga-Cebu line ROW problems and need to secure commitment from the DEO and NGCP on the planned 2nd transmission line between Bohol and Visayas is urgent. Unsolicited proposals. Investors are eager to propose and are waiting for immediate official direction/guidance from the LGU. The 3 DUs will undertake their procurement actions, consistent with the BIPDP. Role of the DUs. The Bohol DUs will not undertake procurement unless officially discussed in the BEDAG. To ensure the integrity of this action, the 3 DUs have initially manifested interest to enter into a separate agreement with the Bohol Provincial Government that its procurement actions will always be done in consultation with the BEDAG, subject to approval by their respective Boards. The USAID COMPETE Project is extending technical assistance to the Bohol Provincial Government, PPP Center, and the Department of Public Works and Highways (DPWH) in the preparation of the feasibility study for the Bohol Bulk Water and Sanitation (BWS) Project, under the public-private partnership (PPP) modality. Through a competitive selection process, the EDCOP-SCHEMA group was awarded the contract to undertake the feasibility study. The contract was signed in September 2014. The BWS project supports the tourism sector in Bohol. Aside from the hotels and resorts operating in the covered areas (Tagbilaran City and 14 adjoining municipalities), at least 10,000 households will benefit from clean water and enjoy Level 3 water service. The project likewise expected to reduce water-borne diseases. On October 10, 2014, EDCOP-SCHEMA presented to the Bohol Provincial Development Council the Project Inception Report. In a letter to TAF COMPETE Project dated 16 December 2014, the Provincial Government of Bohol requested the inclusion of 3 additional municipalities (namely: Cortes, Corella, and Sikatuna) in the geographic scope/coverage of the feasibility study fr the BWS Project. The request was approved by COMPETE and the contract of EDCOP-SCHEMA was subsequently revised, brninging the total number of service areas covered from 15 to 18 (1 city [Tagbilaran City] and 17 adjoining municipalities [Alburquerque, Antequera, Baclayon, Balilihan, Catigbian, Dauis, Lila, Loay, Loboc, Loon, Maribojoc, Panglay, San Isidro, sevilla, Cortes, Corella, and Sikatuna]). On February 4, the Interim and Supplemental Reports were submitted by EDCOP to Governor Chatto during the Bohol Competitiveness Summit. The BWS Technical Working Group is currently reviewing the reports for endorsement to the Steering Committee. Contained in the Interim Report are findings that point to certain issues concerning the identified water extraction sites as being prone/susceptible to slope failure, bank erosion, flash floods, debris flows and siltation. In this connection, EDCOP-SCHEMA recommended the relation of the water extraction sites along the Abatan River. EDCOP-SCHEMA is currently assessing potential sites in Barangay VIGA in Antequera and Camayaan Bridge in Cortes. The team is likewise considering the possibility of tapping Moalong River in Loon as a possible source to augment the Abatan River source, with the idea that it will be able to supply the three municipalities of Cortes, Corella and Sikatuna. Water sampling and topographic surveys in the recommended areas are currently being conducted. Due to these additional activities, the submission of specific reports (deliverables) will be revised but will not result in a change in the performance period — June 6, 2015 remains to be the deadline for the feasibility study.